As the “fourth industrial revolution” takes shape and blurs boundaries between sectors and cultures, it is no longer possible as a business leader to only work with people from the same country, same culture and same background. 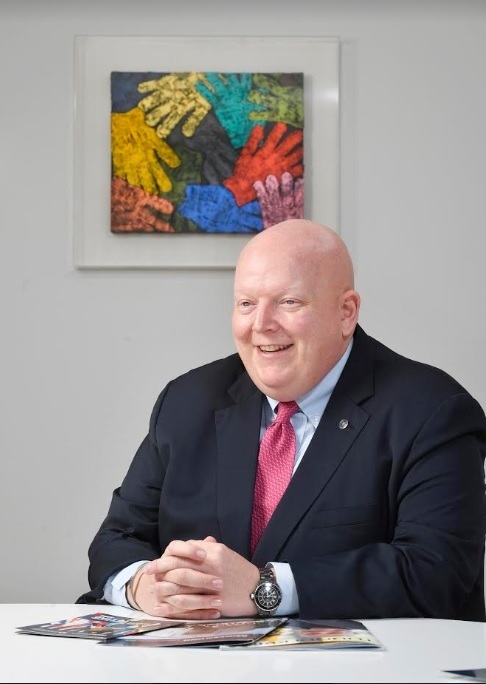 Preparing students to be culturally and professionally more open to diversity is a major role Thunderbird School of Global Management seeks to play for future leaders, said Patrick McDermott, chief engagement officer at the US-based school. “As the world continues to develop, leaders in any given field need to be able to work across sectors,” he said in an interview with The Korea Herald in Thunderbird’s newly opened Seoul office Wednesday. Located in Arizona, Thunderbird, which became a unit of the Arizona State University Knowledge Enterprise in 2014, was established in 1946 as the first graduate school to focus exclusively on training students to help them gain leadership skills needed in a globalized world. The master of global management degree program includes elements of a traditional MBA, but is designed for students interested in becoming global leaders. Students are required to reach proficiency in a second language and carry out consulting projects abroad to gain hands-on experience. Today, there are students from 43 countries on campus. To help students broaden their global mindset, the school created a list of the “T-Bird mindset,” a measurement tool for individuals to assess their global mindset -- how globally attuned and open to learning about and working with other cultures they are. “As we all know, no matter what sectors you are in, we are in a global environment. You have to have awareness of and sensitivity to other markets. Or you are missing an opportunity,” he said. Thunderbird School of Global Management’s specialized master of global management degree topped the Master in Management ranking among 114 schools in the Times Higher Education/Wall Street Journal 2019 Business Schools Report released in December. And Arizona State University has been ranked for the last three years by US News as the most innovative university in America. McDermott took the school’s partnership with Starbucks as one of the examples of innovation the school has pursued. Under the partnership, employees at Starbucks can attend online ASU courses and obtain a degree to improve themselves. After graduation, Thunderbird students join more than 45,000 alumni in 170 global chapters, which meet on a monthly basis. The school has many successful alumni, such as Gordon Smith, consumer and community banking CEO of JPMorgan Chase & Co.; Bob Dudley, group chief executive of BP; and Niels Marquardt, a former US ambassador. To better engage Thunderbird alumni in Korea and recruit more students here, the school opened a representational office in central Seoul on Wednesday. There are an estimated 800 South Korean alumni of the school. The school also has offices in Geneva, Moscow, Dubai, Tokyo, Washington, Los Angeles and Jakarta.